POSKit.com offers industry-leading pricing on a range of Point-of-Sale equipment. Our online-based distribution model allows us to emphasize low overhead costs, efficient inventory management, and low pricing for end-users, system builders, and wholesalers. If you are a wholesaler or system builder and need to purchase equipment in bulk, we are able to offer you a wholesaler pricing. We define wholesalers as purchasers who need to buy more than 5 units at once. If you fall into this category, we would be glad to open a wholesaler account for you. 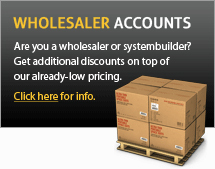 A wholesaler account allows you to purchase products for about 10% - 20% below the already low prices on our website.